This Art Deco painting was made in the 1920’s as a gift for my grandfather by his older brother Jacob, a sign painter in New York. 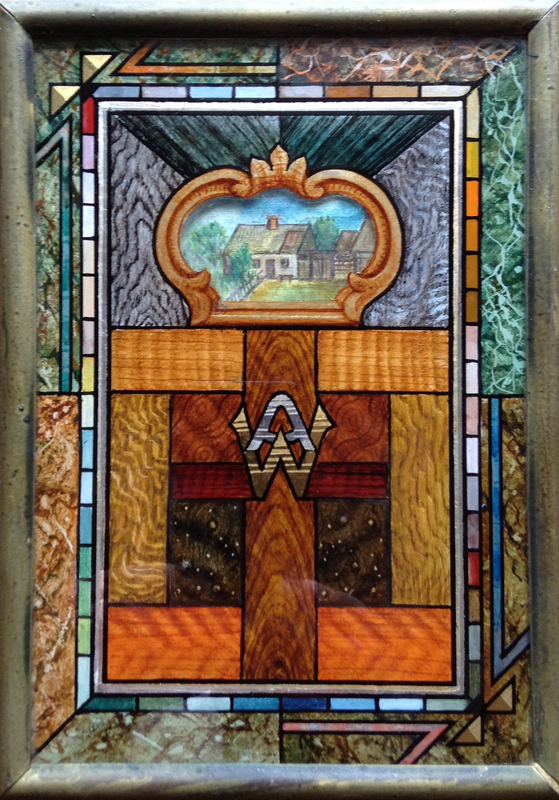 Within the 6”x 8” frame are featured 6 painted marble examples, 8 painted wood varieties, gold and silver leaf, and a miniature picture of their long-gone home of origin, in what is now western Ukraine. The initials are those of my grandfather, Abraham Warshaw. The technique of reverse glass painting is an Old World skill. Unlike the sequence of ordinary painting, fine details go on first, followed by the background. Colors and details remain vivid, protected by the glass. Sign painters of that time were, on occasion, called upon to produce faux finishes and other trompe l’oeil effects. The skill and care that went into the creation of this object make it a family treasure. This photo is courtesy of me. This entry was posted in Craft, Detail, Process, Things I Like and tagged Art Deco, faux finishes, Trompe-l'œil by Kraft. Bookmark the permalink. This is a treasure. Lovely work! Glad that it is in such great shape. The whole piece drips with family history : A record of the ancestral home far away, the skills that the newly arrived emigres had to pick up and use to feed their families, and the affection of one brother for another. So poignant!